I happened to be round the corner and headed to Givi Point Singapore today. Honestly, it wasn’t only until last week that I knew that Singapore had a Givi Point. (Hey! I’m still very new to the motorcycle scene, yah!) And it wasn’t only until about three weeks back that I even knew that Givi stores are called Givi Point’s – until I visited the Givi Point in Penang. I had a pretty good experience with the folks in Givi Point Penang. They were professional, seem to know their stuff, and very helpful. I eventually ended up getting a set of E36N side boxes from them – even though I was pretty certain that I could possibly get it for cheaper somewhere in Singapore if I looked hard enough. But I’m also the sort of person who’s willing to pay a little bit more for good service and expertise. A young sales guy approached me and asked if he could help. Now, of course I knew that to be NOT true. I have a set of E36N’s that fit very nicely on my existing brackets that also hold the E22N’s. “Really? Are you absolutely certain?” I asked. “Yes. I’m very sure.” the Singapore Givi Point sales guy replied. Now that I have BOTH the E22N and the E36N for my bike, I wasn’t really thinking of getting new side cases. So I didn’t want to embarrass him nor tried to press the matter further. But what I WAS potentially looking for, was a *possible* replacement of my Shad SH48 top case. It was a little scratched up after the bike drop in Luang Prabang, Laos, although still very much useable. But if I’m able to get a Givi top case with the same (Monokey?) lock system as my existing E22N’s and E36N’s, and be able to replace all the locks on these boxes to be able to use the same key, that might just give me sufficient push to justify the purchase of a new Givi top box. So I asked him if he knew of any Givi top boxes that will give me that common-key feature. “No. You cannot replace the locks on your Givi boxes to be able to use the same key.” he told me. I know this is absolutely NOT true! 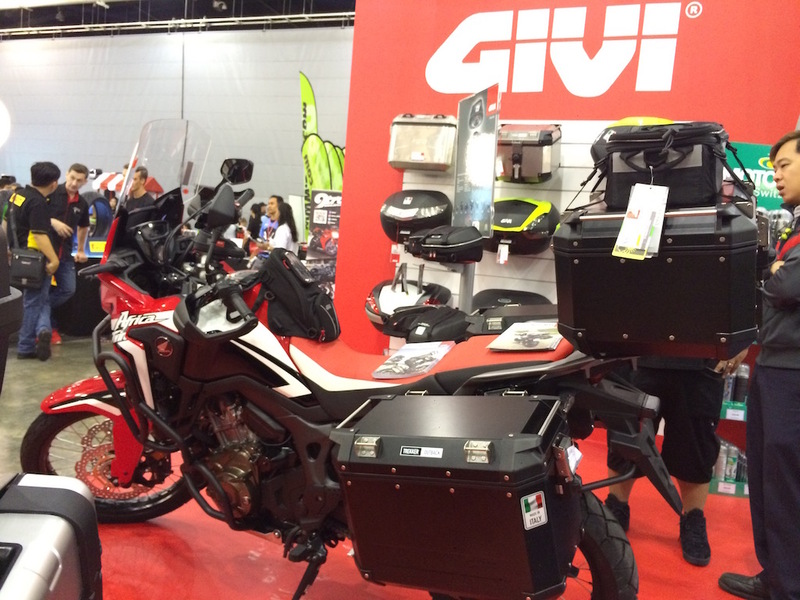 Firstly, Givi actually prides itself to be able to configure the side cases and top box to be able to use the same key. It’s their propriety Monokey system! And secondly, for some reason, when I was in Givi Point Penang, the pair of E36N’s that I had my eyes on came with 2 different locks requiring 2 different keys out of the box. And when I highlighted that to the Givi Point staff there, the sales guy immediately assured me that that is not a problem, and went ahead to replace the locks on the spot. 10 minutes later, my pair of brand new E36N’s were using the same set of keys on both sides. Now, THAT’S service! I eventually bought the E36N from Givi Point Penang. Back to Givi Point Singapore – the sales guy then went on to mumble something about Givi’s “Monolock” and “Monokey” systems, which by now I wasn’t really paying too much attention. But I was really curious about the Monolock vs Monokey difference. So I asked him what the difference was. “Just the cargo weight rating? And ‘Monokey’ and ‘Monolock’ has got nothing to do with the locks they use?” I asked, genuinely surprised. By now, I knew for sure that the conversation wouldn’t bring me anywhere, and that I wouldn’t be getting any correct information on the Givi products that I was looking for. I could very well understand if a shop like the popular Lim Ah Boy or Regina – generalist shops that sells various brands and products at low margins and rely on fast moving goods – to be not-so-up-to-date with their product knowledge. But I cannot accept that while shopping at Givi Point Singapore for a Givi product, and talking to a Givi Point sales rep giving me wrong Givi information. Hey! You’re not a *generalist* shop here. I’m shopping at a SPECIALIST shop. I know that I’d be paying a premium for the same product as compared to, say, if I shopped at LAB or Seng Motor Hung (where I first got my Givi E22N’s.) I honestly didn’t mind paying a little bit more for better service – if I got any, that is. But… Needless to say, I walked out of the shop empty handed. I think this Givi Point Singapore guy just butchered the Givi brand. This is unfortunate. Could you please drop a mail to info@mah.com.sg and let me know which sales person entertained you? Our GIVI point representative is normally a big burly guy by the name of ian and he should not have made such a mistake. Thank you for dropping by. I have dropped you an email, but since you’ve left a note here, I’ll also leave a response. Frankly, I do not wish to identify the sales rep for 2 reasons. Firstly, I do not wish to affect anybody’s rice bowl. But secondly, and more importantly, he did appear courteous and genuinely wanting to help – points scored here for a good attitude. So, then, where lies the issue? If I may humbly identify, I’d wag my fingers at insufficient training. It is unwise to allow anybody to represent a brand or a company without sufficient training. Because this person is then inadequately equipped to empower the customer with a purchase decision. Of course, if that someone is hired as a model or a mascot and as a crowd puller (like you’d see in many motor shows,) it’s then a very different story. Understandably, I never discuss product features with this group as I know that their role is very different. But even so, they should be trained to professionally direct all product questions to a product expert readily nearby. Can I offer a suggestion? Do not expend effort in identifying the person involved. It’s not going to be a productive endeavour. Instead, reflect and springboard from this experience to construct a more robust training programme for the sales staff. Every one of them. Of course, the direction to head will be completely up to the management team. And I genuinely wish you all the best. ← THANK YOU fellow biker FD8352!! ← Lithium-Ion batteries in Motorcycles?